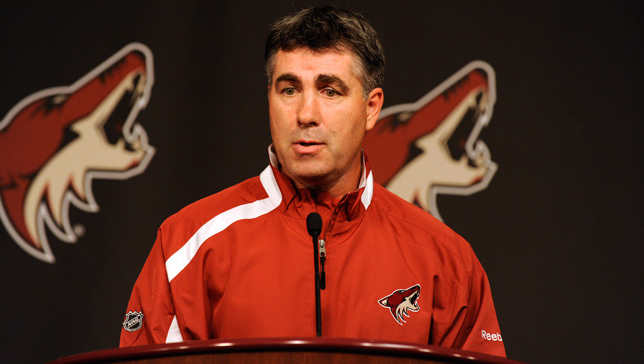 GLENDALE, ARIZONA – Phoenix Coyotes General Manager Don Maloney announced today that the Coyotes have agreed to terms on a long-term contract extension with Head Coach Dave Tippett. As per club policy, terms of the contract were not disclosed. “ We are very pleased to agree to terms with Dave to a long-term contract extension,” said Maloney. “Elite coaching is required to win on a consistent basis and Dave is one of the best at his job in today's game. His work ethic, attention to detail, communicative skills and patience make him an ideal fit with our group as we work to build a franchise capable of winning the Stanley Cup." In four seasons under Tippett, the Coyotes have posted an impressive record of 156-96-42 and have qualified for the Stanley Cup Playoffs three times. Tippett ranks second on the franchise’s all-time wins list and his .602 points percentage is the highest of any head coach in franchise history. In 2011-12, Tippett led the Coyotes to a 42-27-13 record (97 points) and the franchise’s first division championship while guiding the club to its third-consecutive postseason appearance. Under his leadership, the Coyotes won their first postseason series since arriving in Phoenix by defeating the Chicago Blackhawks in the Western Conference Quarterfinals. The Coyotes went on to advance to the Western Conference Final for the first time in franchise history. 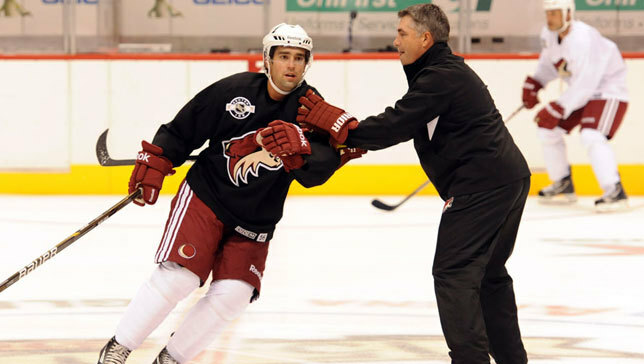 Tippett guided the Coyotes to a 43-26-13 record and 99 points in 2010-11. It marked the first time in team history that the Coyotes had recorded consecutive seasons with 40-plus wins and posted back-to-back 95-point plus seasons. In addition, Phoenix reached the Stanley Cup Playoffs for the second consecutive season, marking the first time the franchise qualified for the postseason in back-to-back years since the 1998-99/1999-2000 campaigns. 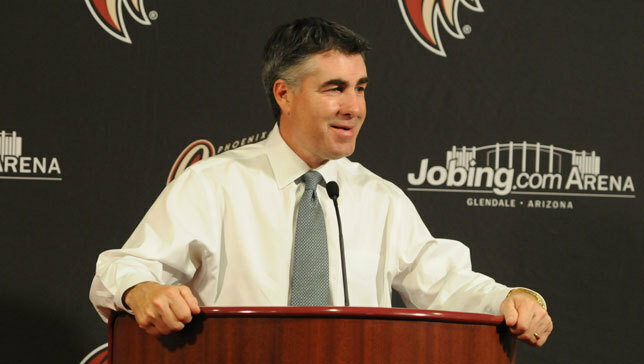 Hired just nine days prior to the start of the 2009-10 regular season, Tippett led the Coyotes to a record of 50-25-7 for 107 points, shattering franchise records for wins and points in a single season while qualifying for the Stanley Cup Playoffs for the first time since 2002 and finishing with the third-most points in the Western Conference. Tippett was honored with the Jack Adams Trophy as the NHL’s Coach of the Year. In 10 seasons as an NHL head coach, Tippett has compiled a record of 427-252-107. His 427 victories behind the bench represent the second-most wins by an NHL coach over that span (Mike Babcock (DET) – 445). Tippett has guided his teams to postseason berths in eight of his ten NHL seasons while also compiling four 100-point seasons, three 50-win seasons and five 40-win seasons. Prior to joining the Coyotes, the 51-year-old Tippett spent six seasons as head coach of the Dallas Stars from 2002-03 to 2008-09, posting a record of 271-156-65. Under Tippett’s leadership, the Stars won two Pacific Division titles (2002-03 and 2005-06), made the playoffs in five out of six seasons and advanced to the 2008 Western Conference Final. Tippett joined the Stars organization in May of 2002 after serving as an assistant coach for the Los Angeles Kings the previous three seasons. The Kings qualified for the playoffs in all three of Tippett’s seasons with the club after having made the postseason just once in six seasons prior to his arrival. Prior to becoming a coach, the native of Moosomin, Saskatchewan played 11 years as a forward in the NHL with the Hartford Whalers, Washington Capitals, Pittsburgh Penguins and Philadelphia Flyers. In 721 career NHL games, he registered 93 goals and 169 assists for 262 points with 317 penalty minutes. During his playing career with Hartford, Tippett served as an alternate captain and earned the Community Service, Unsung Hero, Mr. Hustle and Best Defensive Forward awards. In 1988-89, he registered career highs in goals (17), assists (24), and points (41). Internationally, he captained the 1984 Canadian Olympic Team in Sarajevo, Yugoslavia and earned a silver medal as a member of the Canadian Olympic Team in Albertville, France in 1992. While at the University of North Dakota, he was a member of the 1982 NCAA Division I Championship squad.